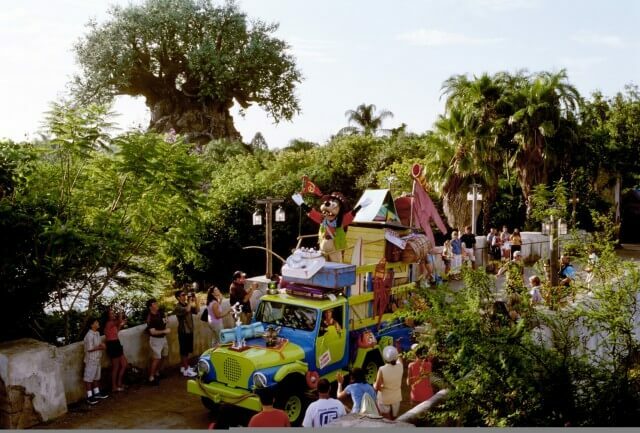 Today Walt Disney World confirmed rumors that Mickey’s Jammin’ Jungle Parade will have its final performance at Disney’s Animal Kingdom this summer in June after nearly 13 years of daily shows. Construction has already begun on the Avatar-themed land and its progress will prevent the parade from progressing normally. When the world of Pandora debuts in 2017, new nighttime entertainment will be added to the park including street performances – but no new parade has been announced. I used to work parade duty for this and while I loved it, I kinda hope they don’t get a new parade. The route in DAK didn’t leave much room for guests to view. I’m not too saddened by this. This was never my favorite parade. I’d love to see Animal Kingdom get a proper new parade eventually, though the new nighttime spectacular in the works might suffice. That’s funny as I always wanted to make sure I saw this one. There was always so much interaction going on, it had lots of non-cast members folks in as parade marshals, and I loved the music. Almost seems like a slow method to take the parades away. They took away the one in DHS and now this one. Magic Kingdom next? The Magic Kingdom has a new parade coming in march called “Festival of Fantasy”. Parades will always come and go but are still a strong staple of Disney. I hope that this is only Temporary, I’d hate to see this wonderful Parade go. Nooo! We’ll be there in July, and missed it our last two trips because of torrential downpours!!! In a twisted irony, the performers will attack Avatar Land’s construction vehicles and defend their parade route from the invading force. Never mind it. It was fun while it lasted. Was in this parade 5 and sometimes 6 days a week for over a year…blood sweat and tears went into it. Very sad to see it go…but contractually I don’t even think it was supposed to carry on this long.